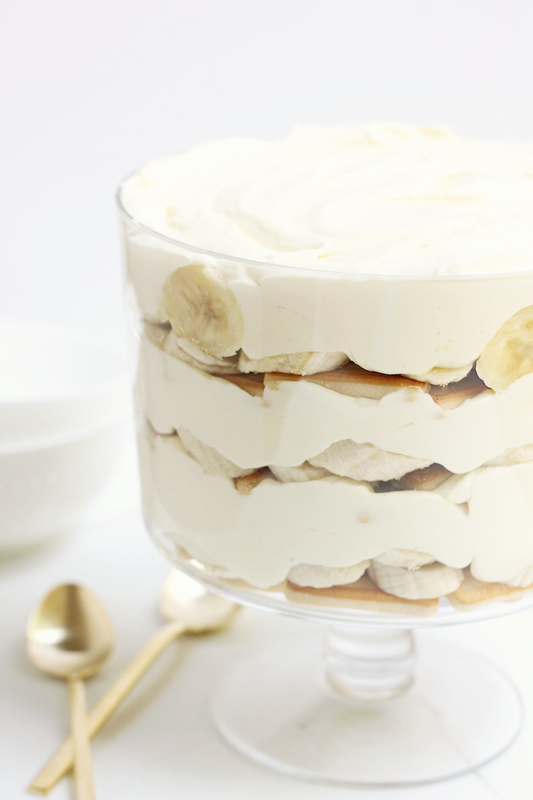 Savor Home: THE BEST BANANA PUDDING... EVER. 1. Add the instant pudding and milk to a medium bowl. Use and hand-held electric mixer to mix the ingredients together. Mix until the pudding is slightly thickened. Set aside. 2. Add the cream cheese and sweetened condensed milk to a large bowl. Use the mixer to mix the ingredients until the mixture is smooth and creamy. 3. Add the Cool Whip to the cream cheese mixture and fold it in until everything is well combined. Add the vanilla pudding to the Cool Whip mixture and gently fold it in. 4. 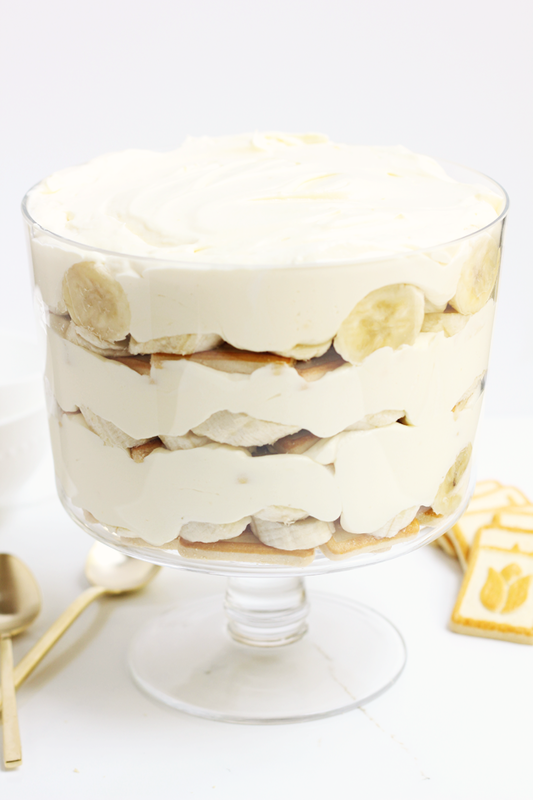 If you using a trifle bowl, here is what to do: Add two layers of cookies to the bottom of the bowl. Slice two bananas and add the slices on top of the cookies. Add 1/3 of the cream mixture to the top of the bananas. Add another two layers of cookies. Slightly press the cookies down into cream so that they create a cake-like texture once it sits in the fridge. Then add another layer of bananas, then the cream. Repeat for the third and final layer. If you are using a 13x9x2 dish, here is what to do: Add a full package of the cookies to the bottom of the dish. 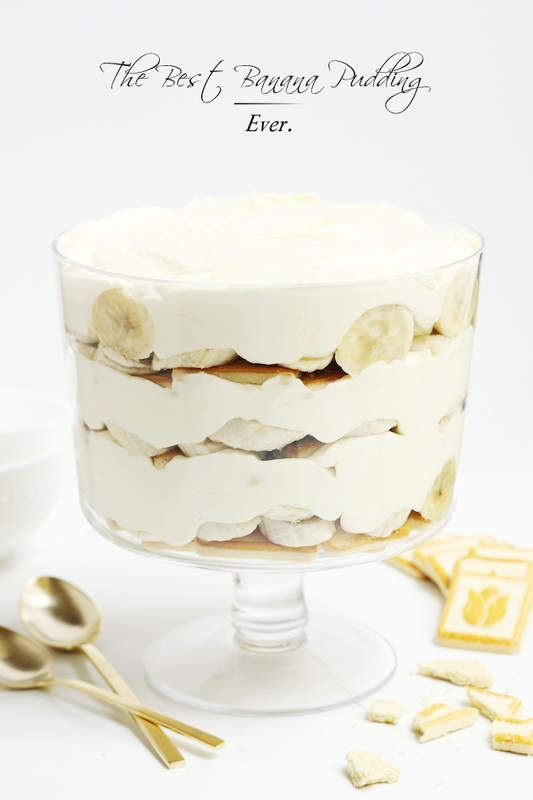 Slice up all of the bananas and add them to the top of the cookies. Then pour all of the cream mixture on top of the bananas. Then add one layer of cookies to the top of the cream. Once it is made, cover it with plastic wrap and store it in the fridge overnight. If you make it in a trifle bowl, you can crumble up some cookies and sprinkle them over the top right before you serve it to add a little crunch. Yum! Now to figure out a gluten free version! Have a fabulous weekend sweet friend. Chessmen cookies, no Tiffany, nooooo. But it is pretty! I thought the Chessmen cookies were all wrong at first, too, but they are AMAZING. So try it if you haven't already. Vanilla wafers work fine, too.